We were having a casual conversation over a sumptuous Chinese lauriat lunch at the Legend Hong Kong Seafood Restaurant right across the World Trade Center in Pasay City when Frankie, as he likes his friends to call him, told us that 2019 marks his 30th birthday, the 60th birthday of his father, ANG President Felix R. Ang, their company’s 30th year in the auto business, and their 15th year as the official Philippine distributor of Chrysler, Dodge, Jeep and RAM automotive brands. The Jeep booth becomes a pulsating hive of activity at the MIAS. During the exclusive media luncheon meeting, Joseph Ayllon, ANG’s PR and communications head honcho, introduced us to the guests of honor, Fiat Chrysler Automobiles Asia-Pacific executives led by Steve Zanlunghi, head of Jeep brand for Asia-Pacific; Mike Tsesmelis, Managing Director for FCA Asia-Pacific; and Isaac Yeo, Country Head for the Philippines. After light conversation and a hearty lunch, we crossed the road onto the WTC and into the 2019 Manila International Auto Show (MIAS) where the all-new Jeep Wrangler Rubicon was unveiled at the Jeep pavilion by the FCA Asia-Pacific and ANG executives. 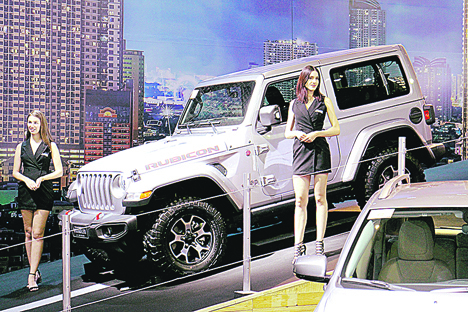 The Jeep pavilion was a hive of activities at the recent staging of the Manila International Auto Show. The Jeep Wrangler Rubicon is now available at the ANG dealerships in two-door or four-door body styles and with a choice of engines – a 2.0-liter turbocharged 4-cylinder that churns out 268 horsepower at 5,250 rpm and 400 Newton-meters of torque at 3,000 rpm OR a 3.6-liter naturally aspirated Pentastar V6 that produces a smooth 286 horses at 6,400 rpm and 353 Nm of torque at 4,800 rpm. Both engine choices will be mated to an 8-speed automatic transmission. The Wrangler Rubicons are Trail-Rated, featuring the 4:1 Rock Trac HD full time four-wheel-drive (4WD) system with locking differentials, 4-wheel heavy-duty FNC disc brakes with ABS, skid plates, front and rear tow hooks, winch-ready front and rear steel bumpers, heavy duty suspension, meaty LT255/75R17C tires, and other rugged features. Despite its off-road stance and rugged demeanor, the Wrangler Rubicon is comfortable interior and offers smooth ride that belies its tough and rugged exterior. There are leather seats, climate control system and an infotainment system with a 8.4-inch touch screen display that works with Apple CarPlay, Google Android Auto, and navigation. There’s also ParkSense rear parking assist system, ParkView rear parking camera, Hill Descent Control, Hill Start Assist, and a lot more safety, performance, comfort and convenience features. The 2019 Jeep Wranger Rubicon fetches P3,990,000 for the two-door with 3.6-liter V6; P4,090,000 for the two-door with 2.0-liter turbo four; P4,390,000 for the four-door with 3.6-liter V6; and P4,490,000 for the four-door with 2.0-liter turbo four.